These days I rarely get out of the house and to work early, and my weekends are smothered by naps and fatigue. I’m always in a hurry to catch a streetcar or subway or running, running, running, in order to get somewhere on time. Breakfast has become a sad misplaced empty desire and is usually a few crackers from my drawer at work washed down with a very, very large cup of strong coffee. Really, it’s no wonder I’ve been feeling run down with not eating much before lunch (which I usually tend get to around 2pm) and running around like a crazy person trying to get places on time. I’m always coming up with new and improved versions of muffins for myself and this weekend was no different. 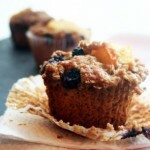 In between catnaps and coffees I managed to concoct some delicious blueberry apricot muffins that, while not exactly healthy per se, they are quite delicious, and filled to the brim with anti-oxidants from the fruit. I eat them with some sliced apples and a handful of fresh blackberries. If you added a dollop of low-fat yogurt you’d probably be able to run a veritable office triathlon like I tend to do every morning (editing grant applications, tracking finances and dodging the bosses; world-class events all). 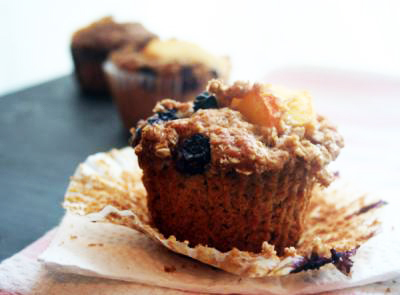 Don’t forget to check out my recipes on YummyMummy.ca — I’m their new “Mummy Eats” Blogger!